How can WASH programmes leave no one behind, as called for in the Sustaionable Development Goals? WSSCC’s new study, Scoping and Diagnosis of the Global Sanitation Fund’s Approach to Equality and Non-Discrimination, helps answer this question. The study reveals that many people who may be considered disadvantaged have benefited positively from WSSCC’s Global Sanitation Fund (GSF)-supported programmes, particularly in open defecation free verified areas. In addition, a range of positive outcomes and impacts related to empowerment, safety, convenience, ease of use, self-esteem, health, dignity, an improved environment and income generation were reported by people who may be considered disadvantaged. Is Exposure to Animal Feces Harmful to Child Nutrition and Health Outcomes? A Multicountry Observational Analysis. Amer Jnl Trop Med & Hyg, Dec 2016. Authors: Derek Headey, Phuong Nguyen, et . al. It has recently been hypothesized that exposure to livestock constitutes a significant risk factor for diarrhea and environmental enteric disorder in young children, which may significantly contribute to undernutrition. To date, though, very little research has documented the extent of exposure to animal feces and whether this exposure is associated with child anthropometry in large samples and diverse settings. This study investigates these issues using data from the Alive and Thrive study conducted in rural areas of Ethiopia, Bangladesh, and Vietnam. These surveys used spot-checks to collect data on proxies of hygiene behaviors such as the cleanliness of mothers, young children, and the homestead environment, including the presence of animal feces. Animal feces were visible in 38–42% of household compounds across the three countries and were positively associated with household livestock ownership and negatively associated with maternal and child cleanliness. One-sided tests from multivariate least squares models for children 6–24 months of age indicate that the presence of animal feces is significantly and negatively associated with child height-for-age z scores in Ethiopia, Bangladesh, and in a pooled sample, but not in Vietnam. There is also suggestive evidence that animal feces may be positively associated with diarrhea symptoms in Bangladesh. The results in this article, therefore, contribute to a growing body of evidence suggesting that animal ownership may pose a significant risk to child nutrition and health outcomes in developing countries. Learn how the Global Sanitation Fund-supported programme in Madagascar is promoting sustainability and achieving strong sanitation and hygiene results trough a cycle of learning, progress and innovation. The latest report from the Joint Monitoring Programme of the United Nations Children’s Fund and World Health Organization highlights revealing statistics on Madagascar’s sanitation and hygiene situation. Approximately 12 percent of the country’s population have access to improved sanitation, while 18 percent have access to shared sanitation that is unimproved, and 30 percent have access to other types of unimproved sanitation. Furthermore, 40 percent defecate in the open. Ensuring improved sanitation and hygiene for all remains a major challenge in the country, but innovations from local partners supported by the Global Sanitation Fund (GSF) are vigorously helping to transform this situation. In rural Madagascar, CLTS is the preferred approach for eliminating open defecation, and these actions also drive overall improvements in sanitation and hygiene. CLTS was introduced in the country in 2008, following its success in Asia. The crux of the approach lies in creating an enabling environment in which communities become self-reliant and improve their own sanitation and hygiene situation without external help. CLTS focuses on igniting change in sanitation and hygiene behavior within whole communities, rather than constructing toilets through subsidies. 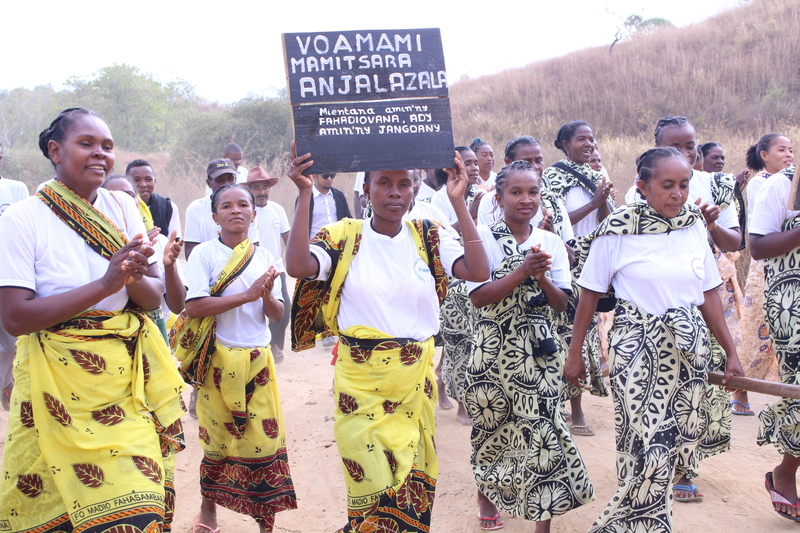 During this social awakening, or ‘triggering’ process in Madagascar, the community looks for visible faeces in their environment. When people realize they are eating faeces this provokes disgust, shame and impacts on dignity. The community then makes and immediate decision to end open defecation. These steps are highlighted in the above video. As the first GSF programme, the Fonds d’Appui pour l’Assainissement (FAA) was the testing ground for various approaches based on the essence of CLTS, which helped to drive the programme’s learning and sharing culture. Sub-grantees have utilized a range of approaches within local communities, sharing their challenges and success with the larger FAA team. Through FAA’s strong learning and sharing system, many of these approaches have been evaluated for their potential to be implemented on a larger scale, and some have become best practices, both within and outside of Madagascar. This case study highlights three best practice approaches evaluated and utilized by the FAA programme: Follow-up MANDONA, local and institutional governance and sanitation marketing. Inspired by CLTS triggering approaches, Follow-up MANDONA is aimed at helping communities speed up their achievement of open defecation free status and initiate the development of local governance mechanisms for sustainability. Read the full article on the WSSCC website. Below are links to 5 Aug 2015 studies on digust, handwashing and maternal mortality, handwashing and NTDs, water quality awareness and breastfeeding and household characteristics and diarrhea. The disgust box: a novel approach to illustrate water contamination with feces. Health & Science Bulletin, June 2015. Inadequate drinking water, sanitation and hand hygiene are responsible for approximately 800,000 deaths per year in low and middle-income countries. We evaluated the benefits of a behaviour change communication method to motivate water treatment practices in urban low income communities in Dhaka. We used a device called the ‘Disgust Box’ to provide a vivid demonstration of how piped water is contaminated with faeces to motivate people to chlorinate water. Most of the respondents were able to recall the demonstration at both four-month and one year qualitative assessments. At four months, the majority of participants stated that they still felt disgusted by the demonstration and mentioned it as a motivator for water chlorination. However, after one year, despite being able to recall the demonstration, disgust was no longer mentioned as a motivator to chlorinate water. The Disgust Box has the potential to be an effective communication method to motivate water treatment but additional research is necessary to establish a more sustainable approach to reinforce behaviour change. Using Observational Data to Estimate the Effect of Hand Washing and Clean Delivery Kit Use by Birth Attendants on Maternal Deaths after Home Deliveries in Rural Bangladesh, India and Nepal. PLoS One, Aug 2015. Authors: Nadine Seward, et al. Our evidence suggests that hand washing in delivery is critical for maternal survival among home deliveries in rural South Asia, although the exact magnitude of this effect is uncertain due to inherent biases associated with observational data from low resource settings. Our findings indicating kit use does not improve maternal survival, suggests that the soap is not being used in all instances that kit use is being reported. Assessment of water, sanitation, and hygiene practices and associated factors in a Buruli ulcer endemic district in Benin (West Africa). BMC Public Health, Aug 2015. Through successful WASH intervention, communities access a new service that improves their quality of life, and also learn about equity and inclusion. The abysmal state of access to safe water and sanitation facilities in the developing world is currently a major cause for alarm; 580,000 children die every year from preventable diarrheal diseases. This is due largely to the 2.5 billion people around the globe who do not have access to safe sanitation. Not only can an effective WASH intervention save lives, it can also engineer changes in the social fabric of communities that adopt these behavioural changes. This points to a key attribute of a successful WASH intervention – that through these programmes, communities not only access a new service that improves their quality of life, but they also learn from being part of a concrete intervention that emphasises equity and inclusion. Let me explain how. Safe sanitation is essentially ‘total’. In a community, even one family practising open defecation puts the health of other families at risk. Also, unsafe sanitation practices pollute local potable and drinking water sources in the habitations. Together, this can undo any gains from partial coverage of WASH interventions. 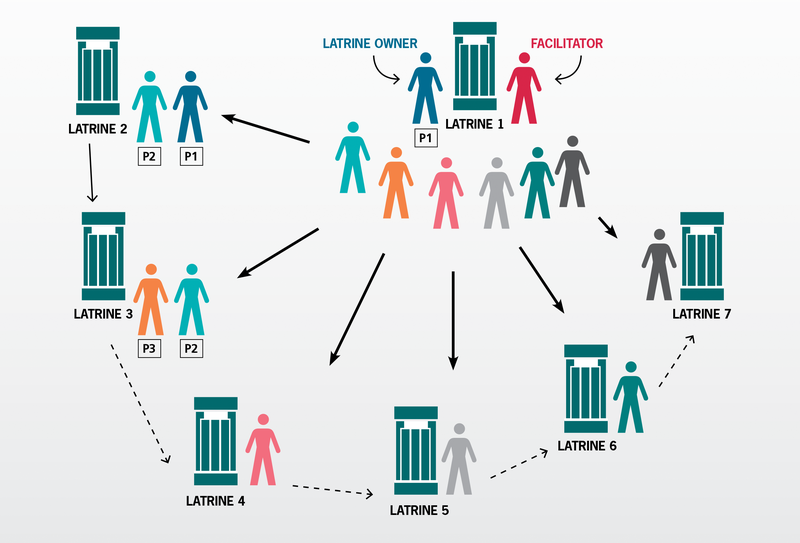 This much is now widely accepted by sanitation practitioners around the world. However, there remains a serious challenge when it comes to the implementation of this concept. When a community is introduced to a WASH-focused behaviour change campaign, there are often variations in the levels of take-up in different families. This could be because of several barriers – financial ability, cultural beliefs, education levels, etc. In response, external agencies have many options. They can focus more on families in their behaviour change campaigns, offer them material and financial support or incentives, or exert peer pressure (which may in some cases become coercive, etc). However, the best approach – whether facilitated by an external agent or not – is for a community to devise a collective response. The issue should be framed as a collective action problem that requires solving for the creation of a public good. In many instances, communities have come together to support the poorest families – social engineering at its finest. At its best, recognising the needs of every member of a community will lead to a recognition of the challenges that the typically marginalised groups face. It is this recognition that could prompt a rethink of social norms and relationships. Read the full article on the WSSCC Guardian partner zone. Raise your hand for hygiene: Sign on to call for a global hygiene indicator in the SDGs! The issue: The Post-2015 Sustainable Development Goals are the successors to the Millennium Development Goals; a draft was published, and the details of the SDGs are being negotiated now. Hygiene is essential for achieving global development, and is therefore included as a target as part of Goal 6. Countries will commit to demonstrating progress on achieving the targets by reporting on indicators. However, in the recent list of global-level indicators being considered by the UN Statistical Commission, hygiene has been deleted. This is likely because the decision makers want a shorter list of indicators. However, demoting hygiene to a huge, secondary list of ‘optional’ indicators will not give hygiene the priority needed for the SDGs to have real impact on both hygiene and the areas that it influences—such as health, education, and equity. Objective: The JMP Communications and Advocacy Group is coordinating delivery of a persuasive message about the importance of hygiene to encourage decision makers and stakeholders to act and recommend the reinstatement of a hygiene indicator in the list of global-level indicators for the SDGs. Audience: This letter will be sent to members of the UN Statistical Commission and others who may have the opportunity to influence discussions and decisions around the SDG Indicators process.